There’s nothing more rewarding than seeing our toddlers reach certain milestones in their life, but, let’s admit it – Raising a toddler isn’t all about rainbows and sunshines. While nothing can be more rewarding than seeing our little ones achieve greater things, one way or another, they’ll have those mood swings every now and then. Without a single doubt, one of the most difficult things that we, parents, have to go through when raising a toddler is being able to deal with tantrums. One second he’s happy, and immediately after that, he’ll start screaming and kicking – real loud! Why Do Toddlers Throw Tantrums Anyway? In the first place, why do toddlers even have these mood swings? It may baffle you – and this is completely understandable as a parent. There is no need to worry though – pediatric experts mentioned that tantrums were part of growing up and are completely normal. At this stage, your toddler can now climb, jump, and run without difficulties. They may even try to get that huge book from the top shelf – and you stop them from exploring their world. Because they don’t understand the dangers that could happen when they try to pull books from that shelf and you try to stop them, they’ll feel betrayed and that you stopped their tiny little adventure. There are many reasons behind tantrums, but the good thing is, you can do something about it. As mentioned earlier, these mood swings are completely normal, and you can’t stop them – unless they have started to overcome this stage. Here are 5 simple tips to help you control your little child’s tantrums. Instead of saying no, why not offer them different choices? Remember, your toddler is trying to explore his/her environment, and he wouldn’t take a ‘no’ lightly. This will just initiate their mood swings. Allow your toddler to make simple decisions, to avoid power struggles. One of the common causes of tantrums is when you try and transition from one activity to another. Instead of immediately transitioning, give your toddler a countdown. This is to set expectations and to let them know that there are limitations to what they can do. For instance, “you can watch one more show, then we’ll eat lunch”, or something similar. When they know what’s coming up next, they can condition themselves and these mood swings can be avoided. At this stage, your toddler won’t understand the reason behind their need to go to bed early, or why they need to put on sunscreen. There is no point in reasoning out with them – instead, give them a short explanation that they can understand. Reinforce and repeat if necessary. I know – this is difficult especially if they’ve started throwing out these tantrums, but it is important that you keep your cool, especially during instances like these. If your toddler sees that you are firm, and that you’re not struggling, they might just give in easily – which is another secret that every parent should know. The first and the most common cause of toddler tantrums is overtiredness. Avoid exhausting them too much and make sure that you watch out for signs that they’re sleepy. 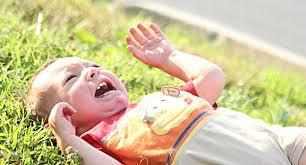 If a toddler is tired, they’re most likely to throw in tantrums. If you can avoid them feeling exhausted beforehand, you can also avoid tantrums occurrences. Tantrums can be frustrating for most parents – but remember these five top tips and you’ll gradually notice that your toddler will have better mood; more smiles, less screaming!